How Often Should You Clean Your Duct Work in Your Home or Business? Home/Blog/How Often Should You Clean Your Duct Work in Your Home or Business? Homeowners all over the world are asking the question of how often should you clean your duct work. Typically, the suggested frequency of having your duct work cleaned ranges anywhere from 1 year to 5 years. This variable is somewhat broad but is dependent on several factors that are relevant to each specific situation. Some of these variables include things such as the type of environment you live in, whether it is dry and dusty or wet and damp. Both of these situations can present issues that will cause the duct work to be cleaned more frequently than in some other situations. 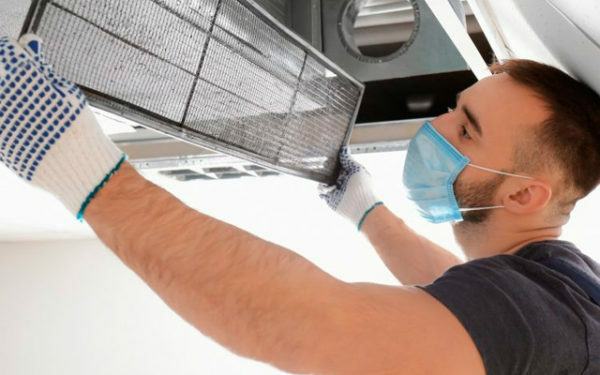 Another factor that can play an integral role in the frequency of your duct work requiring service is if you have members of your home who have weakened immune systems or allergy issues. It is also important to take into consideration the air duct cleaning surface, which leads us to our next category of the various options for the cleaning of the duct inside your home. There are a few steps that must be performed in order to properly complete the duct cleaning process. Inspection: A good company will have special equipment that will perform a thorough inspection of your duct work and determine the degree of buildup that has accumulated. Protective gear will sometimes be worn during this process as a precautionary measure. Access: The ability to access the areas that need to be cleaned is extremely important. Due to this, special access tools must be used in order to complete this process correctly. It isn’t as simple as entering from one point and making things look good aesthetically. The process must be completed properly in order to achieve the desired effect that a duct cleaning should accomplish. Hand-cleaning: Technicians will often use tools that are used during the hand cleaning process. This process will disengage any debris and dirt that may be stuck inside your duct work. This process makes the cleaning process easier and more effective. Wet and Hepa Vacuums: Professionals who are very systematic in the completion of their job will often use a vacuum equipped with a special HEPA filter that will eliminate accumulations of water that may be inside the duct work. The question now becomes how often duct cleaning should take place. Should I repeat this process annually or is there a set schedule by which I should perform this maintenance? The answer to this question varies widely based on location and environment. One of the factors that affect this is living in a very dry and dusty environment. If that is the case, you may accumulate dust and debris inside your duct work at a much faster rate than someone who lives in a newer home in a city where dust isn’t as large of a factor as it may be in a more rural environment. We at Comfort Clean would be honored to serve you for all of your duct cleaning needs and ensure a satisfactory job performance competed in a timely manner by professionally trained employees.